Home School It’s beginning to look a lot like Christmas…. 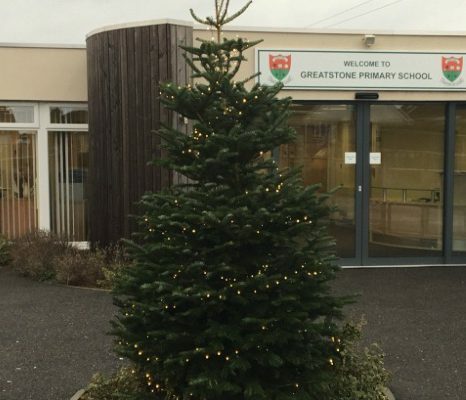 So today is Greatstone’s first day of Christmas. Each school day between now and the end of term a class will be sharing something Christmasy special with their parents carers and family members. Today Rhinestone class have a craft and singing afternoon planned. A special thank you to Mark Coleman of M.Coleman Arboricultural Service for the gift of our beautiful outdoor Christmas tree. Mark is a brilliant groundsman; our school environment always looks tidy. Another thank you to Mr Hardy, grandparent of Milly Cox in year 1 for the fab bench he made for the children to sit on and change into their trainers at playtimes. Being able to use the field, although a little muddy (sorry for the extra washing) make such a difference to the children, enabling them to have space to play well. It also means they are back to afternoon lessons in a good state of mind and ready to learn. You may be aware that Mr Sharp our Estate manager is poorly at present and hasn’t been at school. I’m sure you will join me in wishing him well. We miss your magic tricks Mr Sharp! On Monday we shall open our school Christmas post boxes. Classes have their own ones for cards sent to friends in the class and then there is a main postbox for interclass deliveries. Full names and class names are helpful! Monday is also the day when teddy bear raffle tickets go on sale. Tickets are 10p each and each class has a teddy or cuddly toy they are raffling. The raffle will be drawn in our assembly on the last day of term. And finally, don’t forget the PTFA Christmas Fayre on Tuesday after school. There will be a chocolate tombola (contributions gratefully received), some games such as ‘Rudolph Hoopla’ and of course individual tables of crafts. I’m looking forward to another weekend of sewing in preparation for my stall! Take care and I look forward to seeing you all over the next two weeks at our events.